"Paris is always a good idea." That joyous little bon mot has become a universal mantra since Julia Ormond uttered it in the 1995 remake of the classic 1954 film Sabrina. These six seemingly innocuous words perfectly encapsulate the magnificence of the French capital—its beauty, its historical significance and its irrepressible joie de vivre. Late last year, however, for perhaps the first time in recent memory, the lure of Paris was overwhelmed by apprehension. The terrorist attacks of November 13, which took the lives of 130 and injured 368 others, shook the city's foundations. In the weeks following, numerous tourists cancelled their trips, and many citizens avoided crowded areas and public transport. For the parents of the 20 high-profile young women scheduled to take part in the famed Bal des Débutantes, the concept of putting their daughters in the spotlight must have challenged every instinct. In the minds of the young women who had agreed to take part, however, there was no doubt that the show must go on. "How would it help to not participate in le Bal?" asks 16-year-old Sonia Ben Ammar, daughter of film tycoon Tarak Ben Ammar, when we meet in the dressing room a day before the ball. "You can't give these people what they want—and what they want is to break down our ideologies and stop us living our lives. I'm not going to live my life in fear." For those who aren't au fait, le Bal (as it's known for short) is a grand gathering of mademoiselles from the world's most influential families. The event has been a fixture on the calendars of high society since 1992. Each girl is personally invited to take part by le Bal's founder, Ophélie Renouard. An arbiter of taste and a celebrity in her own right, Renouard's unrivalled little black book bursts with direct lines to politicians, power brokers, princes and pop stars. Traditionally held at the Hôtel de Crillon, a Rosewood Hotel that's currently undergoing renovation, the 2015 incarnation of le Bal took place at the monumental Palais de Chaillot. Le Bal may be modelled on the traditional English debutante ball, but there's nothing stuffy about this jaunt in the City of Light. 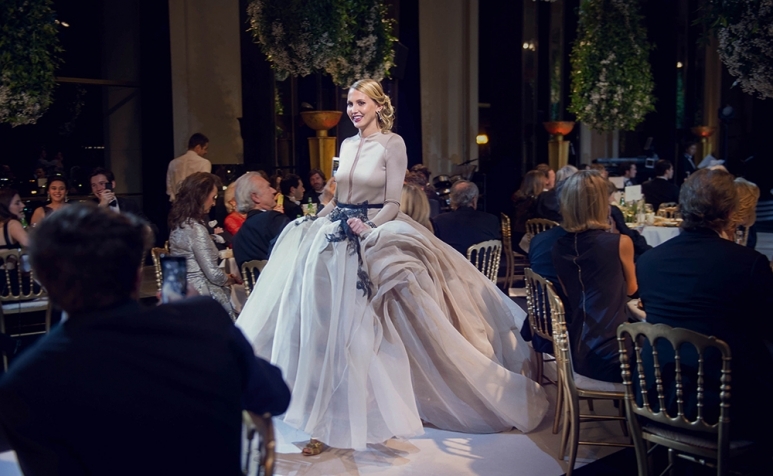 White gowns and tiaras have no place at this quintessentially Parisian affair; the belles of le Bal strictly don haute couture as well as bespoke jewellery by Payal New York. High-fashion houses fawn over these charming young women‹they see the girls as aristocratic ambassadors for their brands. It's not all about beauty and breeding, however. Every year, proceeds from le Bal are donated to two charities: the New York City-based Seleni Institute, which supports the reproductive and mental health of teen mothers, and Enfants d'Asie, which promotes the education of young girls in Southeast Asia. This time around, le Bal has taken on even greater meaning as a symbol of solidarity and a celebration of civilised society. "The ball isn't just about beautiful dresses—it's about the empowerment and strength of women. This year, I suppose it's also about the strength of the city," says Hong Kong debutante Vanessa Wang, who is studying history and international relations at Brown University in the US. "By participating in le Bal, we're saying, 'We are here, standing strong.' We won't let this horror phase us." Perhaps the most prominent debutante is Sonia Ben Ammar, a precocious Parisian belle who splits her time between Paris and Los Angeles, where she is recording her debut album. The self-confessed "super-hyper" Sonia sings and plays piano, and made headlines last year when she was snapped canoodling with Brooklyn Beckham, the son of David and Victoria. Her supreme confidence strikes me as more American than French. Beneath the Chanel Haute Couture, the intimidatingly beautiful Sonia is a tomboy. "Physically, I'm a girl, but I think I'm a boy at heart," she says and laughs. "I love boxing and I'm a roller coaster junkie." Alongside Sonia is her close friend Iman Perez. The offspring of French film industry luminaries, Iman is a bubbly showjumper who spent her childhood riding at her family's country estate near Fontainebleau. Energetic and open, Iman has a penchant for Iceland, an aversion to cheese and a love of film—well, one particular film. "Did you ever see Dreamgirls?" she blusters excitedly. "I loved that movie. I once watched it 13 times in seven days. And it was summer!" Iman aims to be a professional model, and with her chocolate locks and slender limbs she's a shoo-in. In fact, Jean Paul Gaultier, the designer of her stunning green gown, booked her for his Paris show in January after seeing her in his asymmetrical creation. Dominique Cojuangco, the daughter of Filipino actress Gretchen Barretto, is a vision in Vivienne Westwood Couture. The charming 20-year-old radiates a warmth and maturity well beyond her years; she's studying fashion and hopes to be running her own label in 10 years. "I decided to take part in le Bal because I think it's important to keep traditions alive," says Dominique, who boasts more than 400,000 followers on Instagram. "Of course, these days people debut themselves on social media. But I think it's important to support fashion houses, haute couture and hand-sewing. We should treasure these traditional techniques." If there were an award for the most dramatic gown at le Bal, the effervescent German countesses Sarah and Victoria von Faber-Castell would surely be contenders. The blonde twins sport eye-catching haute couture numbers by Stéphane Rolland and cause quite a stir when they parade down the red carpet, arm-in-arm with their cavaliers. The girls, who belong to the illustrious Faber-Castell pencil-manufacturing empire, may finish each other's sentences but have remarkably different personalities; Victoria's world revolves around fashion, art and romantic poetry, while Sarah loves to skateboard and hunt. "It's a family thing," muses Sarah on the subject of hunting. "My grandfather and my great-grandfather did it. We grew up in a hunting house outside Nuremberg and I think it's a wonderful tradition. It's not just about killing animals. To get my hunting licence, I had to study for almost three months—and it was the hardest exam I've ever sat. I learnt about every tree, every shrub and every animal in every national park in Germany. You don't just have to be an impeccable shooter, you have to be a nature expert and..." Victoria rolls her eyes good-humouredly. "Okay, Sarah, we get it," she chirps, adding that her sister could also be a competitive eater. Perhaps the most regal debutante is Countess Gloria de Limburg Stirum, a Belgian beauty descended from the house of Bourbon. Her paternal grandmother was Princess Hélène of Orleans and, clad in a whimsical Zuhair Murad gown, Gloria looks every bit the part of European royalty. Her calm, genteel exterior, however, belies a dry sense of humour. "I'm descended from those who got their heads chopped off during the French Revolution," she offers up nonchalantly when asked about her family history. "It's ironic because these ancestors of mine actually voted for the assassination of the royal family. They betrayed their family in order to save their own skins, but ended up getting killed as well. So the moral of the story is don't betray your family, I suppose." Gloria is fascinated by Africa and speaks fluent Swahili. Concurrently with her university studies, she does charity work with the Isibani Community Centre in Drakensberg, South Africa, which provides housing, clothing and education to the region's poorest people. The debutante causing the biggest stir this year, however, is Olivia Hallisey, a softly spoken 17-year-old from Connecticut who walks down the isle to deafening applause on the night of the ball. In September 2015, she took home the top prize at the Google Science Fair for developing an early-detection Ebola test. "It just kind of happened," she says and smiles modestly when I ask how she made the discovery. "There's a science research class at my school and it just developed from there." She's also a competitive swimmer and, despite this being her first trip to Paris, she's been training in a nearby pool for two hours every day. I wonder what she hopes to achieve by participating in this celebration of fashion and breeding. "My parents really wanted me to go. They were like, 'Do it. Be a princess for a weekend.' But there are lots of aspects I like about it. I have loved meeting an international community of people and I've made some really great friends." The night air is clear and crisp and the Eiffel Tower twinkles outside the windows of the ballroom. Inside is a sea of twirling gowns, gallant young men and fathers embracing their daughters. The enchanting scene is a vision of hope and cheer. Nothing, it seems, could possibly dim this city's glow. Tonight may be the beginning of long-lasting friendships, even of young love. Whatever the future may hold for these women, one thing is certain—they'll always have Paris.